NEW YORK, December 28, 2018	(Newswire.com) - JC Whitney, the leading retailer of aftermarket parts, awarded a fully refurbished 2017 RAM truck to Utah resident, retired firefighter and medic Brad R who worked for more than 40 years as an EMS. It was announced at the SEMA (Speciality Equipment Manufacturing Association) trade show in October in Las Vegas. 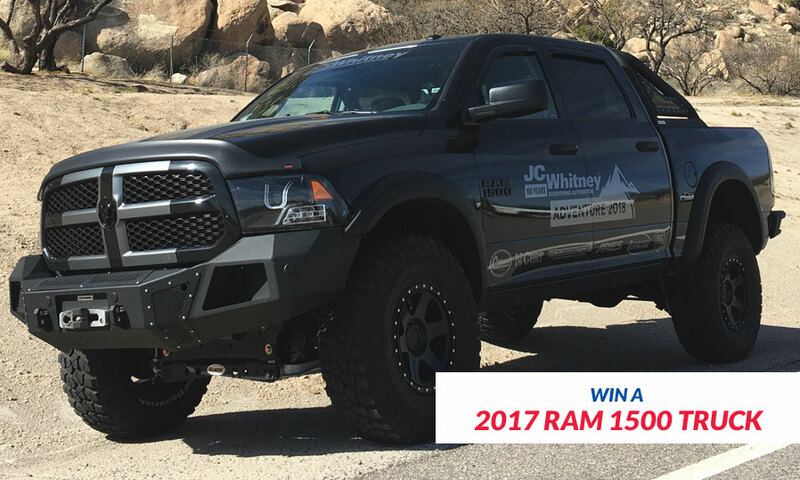 The 2017 RAM truck was the grand prize in the 2018 “Pay It Forward” sweepstakes, which was sponsored by JC Whitney’s parent company, U.S. Vehicle Parts Network Inc. Supporters included ARIES, CURT, Crown Automotive Sales Co Inc, PowerStop, and Rancho Suspension! The sweepstakes included monthly drawings with prizes ranging from lift kits, accessories such as upgraded power brakes, speakers, etc.--to the grand prize of the fully remodeled 2017 RAM truck--and was open to active or retired members of the US Military, firefighters, emergency responders or active or retired law enforcement officers. "While attending events across the country, we met many Veterans and Active Military members as well as police, fire and EMS personnel and learned that many of them had enjoyed long relationships with the JC Whitney brand. We wanted to thank all of these heroes for their dedication, and we agreed that building a custom truck and conducting sweepstakes would be a great way to show our support and appreciation,” said Rob Mullner of JC Whitney. He continued: “Giving someone this truck was a great way for us to say thank you.” While not required, JC Whitney strongly suggested that applicants send photos of themselves in uniform, together with their stories, to JC Whitney’s American Heroes Gallery. About JC Whitney: JC Whitney was founded in 1915. The company caters mostly to DIY jeep and truck enthusiasts but carries a wide assortment of parts for car models of such well-known brands as Ford, Chevrolet, Mustang, Lexus and more. To obtain an e-version catalog: click here. About SEMA: SEMA is the largest automotive trade show in the world, highlighting specialty products. The event, held yearly in Las Vegas, is known for spotlighting innovation, inspiration and current trends. The next SEMA show is scheduled for November 2019.